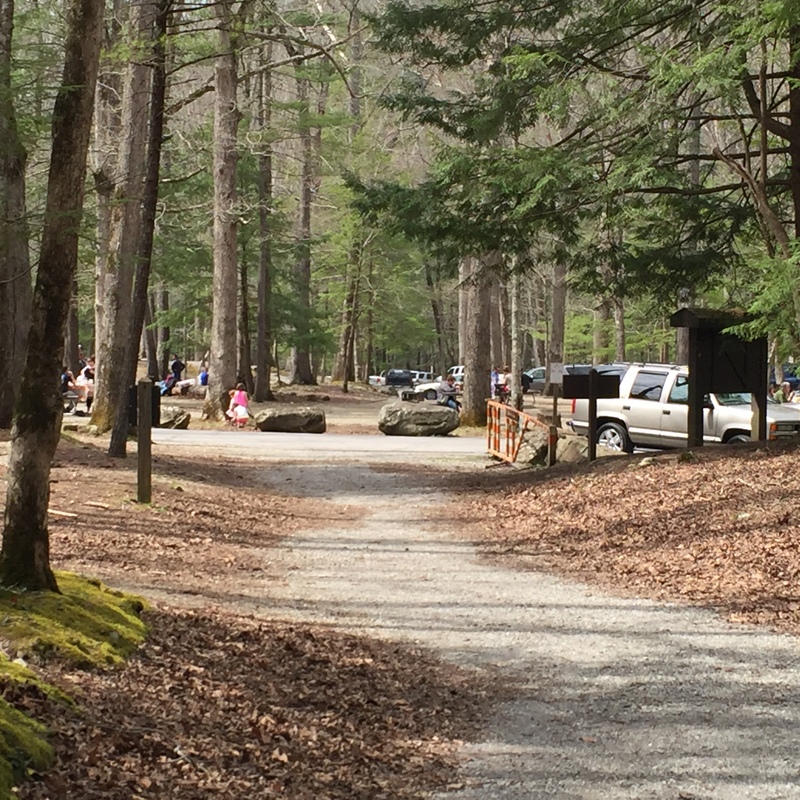 Cades Cove Picnic Area at the Anthony Creek Trailhead, 8:50 am on the Saturday before Easter. There is only one other vehicle in the area and this end of the park was surprisingly quiet and devoid of visitors. Nonetheless, it was a beautiful morning, temperature in the mid 40’s. This particular loop is a popular one as it features the Appalachian Trail, two shelters and the delightful Spence Field. It is also an access point for Rocky Top and Thunderhead. Perhaps one of the best features is the fact that one does not have to negotiate Cades Cove Loop traffic to get to the trailhead. 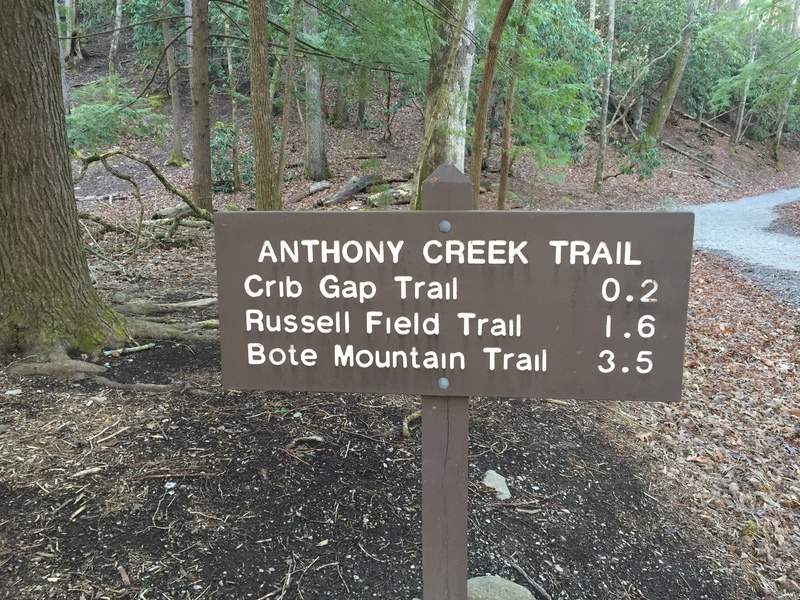 The route is Anthony Creek Trail to Russell Field Trail to the AT. 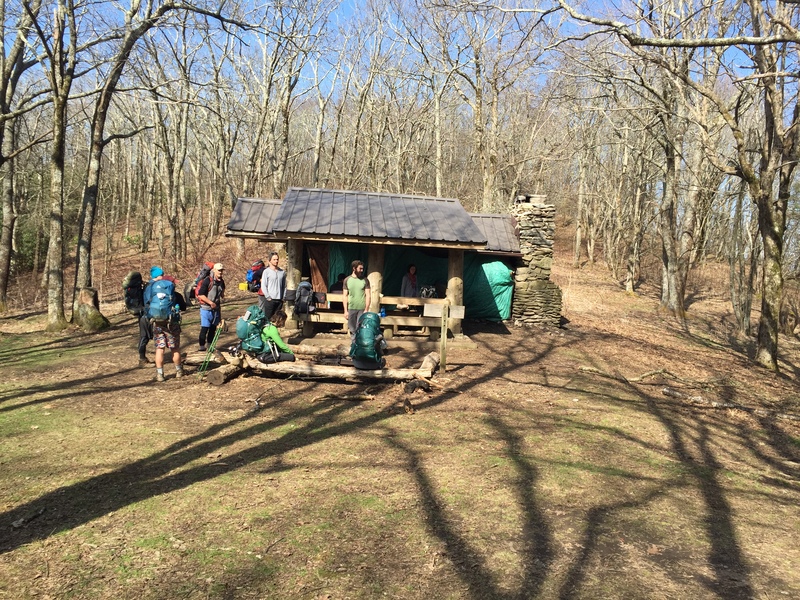 From the Russell Field Shelter on the AT to Bote Mountain Trail at Spence Field, down Bote Mountain to Anthony Creek and out, making up the lolly pop shape of the route. 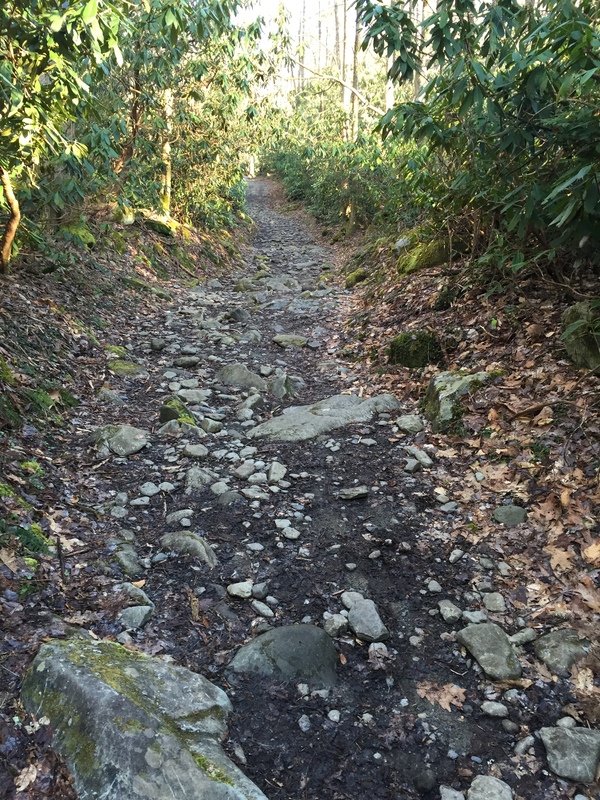 Overall, the hike is moderate difficulty at about a Class 4 but the climb up Russell Field Trail is a 10% grade. 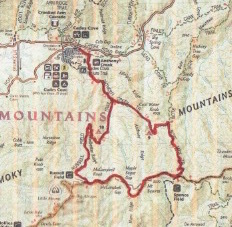 The descents on Bote Mountain and Anthony Creek are 12% and 9% respectively making this particular direction the more desirable; steeper on the way down… There is plenty of water on this loop and there are two shelters and two campsites. The hike up the lower portion of Anthony Creek Trail starts out in a gentle climb on a wide gravel road. At 0.2 miles on the left is the Crib Gap Trail leading 1.6 miles to Turkey Pen Ridge. The 900 Miler should consider this as a potential orphan. Just beyond lies the horse camp. The morning turned even more beautiful as the gentle climb continued, passing through evergreens that seem to be under attack as many were dead and some still standing. The trail follows Abrams Creek, crossing it a few times until about 1.5 miles where Anthony Creek and the Left Prong of Anthony Creek come together. This is the headwaters of Abrams Creek which has become so special in the heart of this hiker. At 1.7 miles and 29 minutes, is the intersection with Russell Filed Trail. Russell Filed is single track and follows Left Prong Anthony Creek as the climb steepens to a 10% grade over the next 3.5 miles. At 0.9 miles on Russell Field Trail is the Leadbetter Ridge Campsite #10 which is a good rest spot unless there are late sleeping inhabitants who would appreciate not being disturbed. The rhododendron and laurel start to show up as low shrubs. Look for wonderful blooms in this section early summer. The trail crests a ridge at 1.9 miles with views opening up of Cades Cove. At around 3 miles, Russell Field Trail opens up to grassy fields and yet the climb continues steadily. Note a large clearing on the left at 3.4 miles with an unofficial campsite. 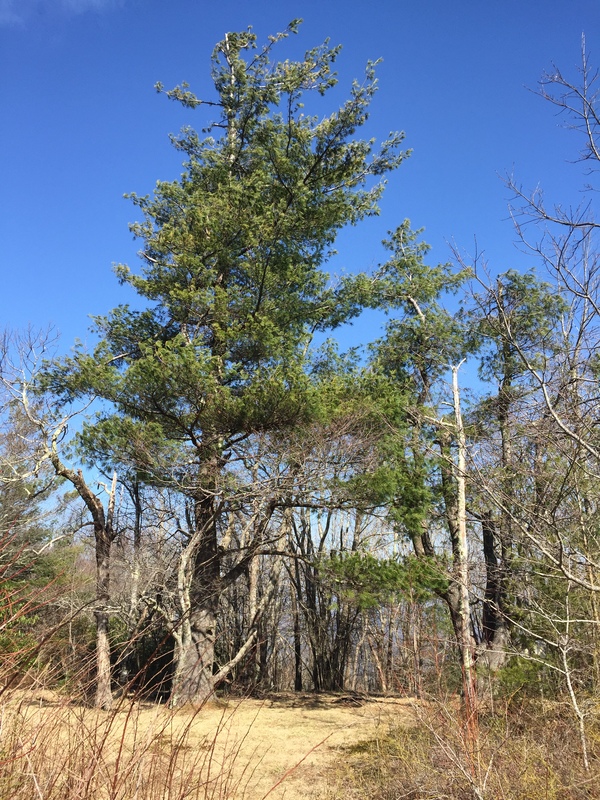 An unusual pine tree keeps sentinel over this peaceful spot. One can see why campers would be attracted to spend a night here. Russell Field Trail ends on the AT at Russell Filed Shelter. There were a half dozen hikers enjoying lunch at the shelter when a group of college friends on spring break showed up early for the evening. I enjoyed a good conversation with them as they were all from Elon College and had all studied entrepreneurship. 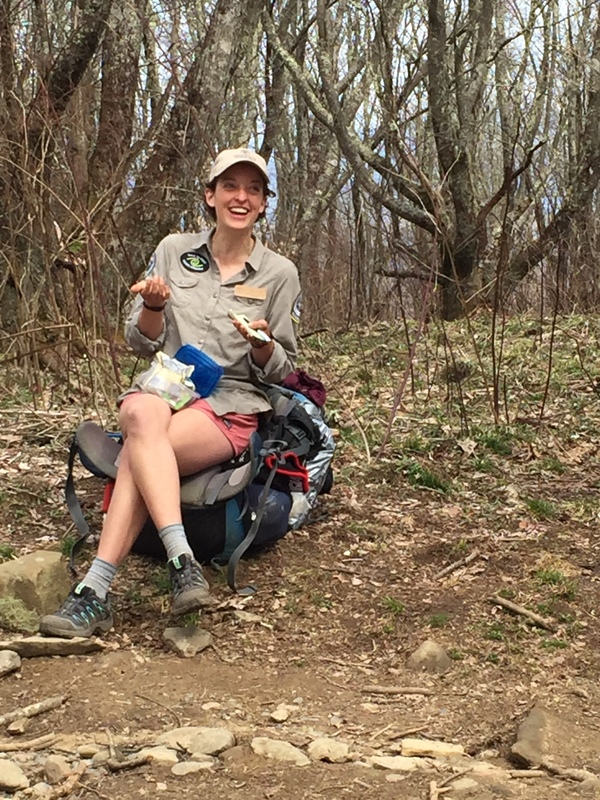 While we enjoyed our lunch, there was a steady flow of hikers on the AT, many of which were no doubt AT Thru-Hikers as it is the time of year for their annual migration to pass through the Great Smoky Mountain National Park. Striking out on the AT just before noon found typical ridge hike rolling up and down as my right foot landed in North Carolina and my left landed in Tennessee. At about 1.2 miles on the AT is a very interesting tree in later stages of decay. A number of day hikers passed me heading south on the AT. The trail is largely mixed hardwoods until at about 2.7 miles when Spence Field opens up. The clouds have rolled in obscuring an otherwise beautiful view. A hundred yards before the side trail to the Spense Field Shelter is what could be desrbed as a rhododendron “gateway” through which the trail runs as you near the intersection with Bote Mountain Trail and Eagle Creek Trail. I stopped for some water and conversation with a 900 Miler. Before long a ridge runner with the Appalachian Trail Conservancy joined us and shared a few stories about this years class of AT Thru-Hikers. All along this time was a steady flow of backpackers moving in both directions. It was nearly as bad as driving in Cades Cove. I am so glad I will not be staying with the crowds amassing at all the shelters and campsites in this area tonight. I took off down the steep rocky descent on Bote Mountain Trail and was making great time while passing several weary hikers on the way up looking for encouraging news about the end of their arduous climb. I tried to be cherry but letting them know they still had a mile to go did not land with great tidings. At about 1.5 miles I passed a young lady sporting a pair of Ray Ban Wayfarers. 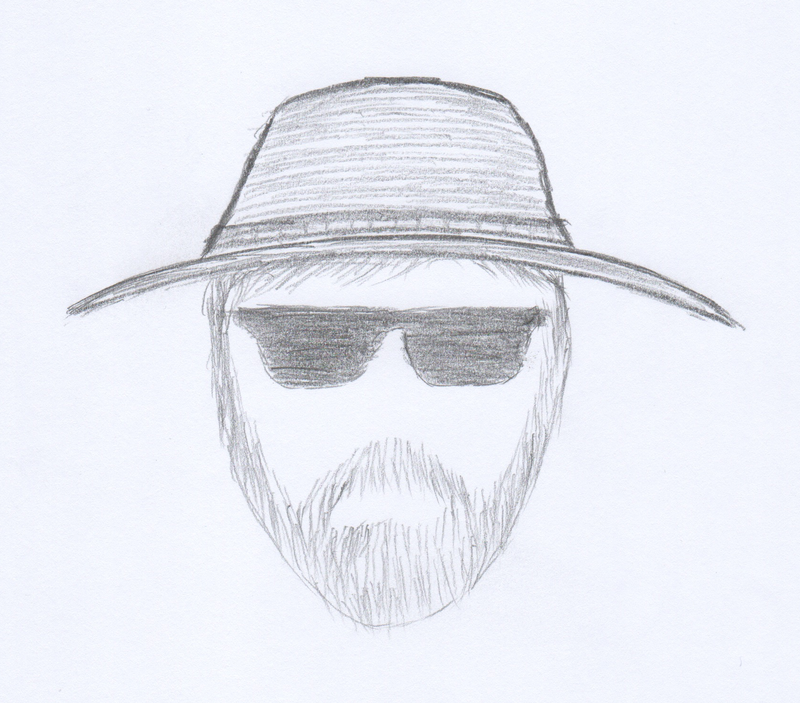 The sight of her glasses reminded me that I did not have my own pair properly mounted on the bridge of my nose. When they failed to show up in any of my pockets or my daypack, I concluded with much sadness that they must have been left back at the AT. Having descended about 1,500 feet over a couple miles, I elected NOT to go back up and look for them. The intersection with Anthony Creek Trail arrived at 1.7 miles. The top of Anthony Creek Trail is fairly steep and somewhat muddy. At about 0.3 miles, a view of Cades Cove opens up through the trees. At 0.5 miles, you can hear Anthony Creek singing songs of welcome, which will be with you all the way back to the trailhead. At 0.7 miles is Anthony Creek Campsite #9 which is a very large and popular campsite. Today was no exception as there were several campers staking their claim early in the afternoon. At 1.3 miles the 9+ % grade descent continues with the rocks adding a rugged component to the hike and a source of torment to aching feet. At 1.9 miles is the intersection with Russell Field Trail. The next 1.6 miles are repeat mileage but the trail lightens up to much more pleasant hiking. At 2.2 miles the gravel road returns. All along this stretch are a number of nice cascades keep one company courtesy of Abrams Creek. Decision confronted me at 3.4 miles. It was about hiking 2.4 miles out and back on Crib Gap Trail. To make the story short, let’s just say I have a 1.2 mile orphan to pick up later. I made the 3.5 miles down in 3 hours and 2 minutes and was greeted by a vast mob of picnicers. Despite the great smelling food cooking, I was quite anxious to hop in the truck and get outa there! A 14 mile day with 3,200 feet of climbing was my reward and my portion of being. This entry was posted in Trail Log and tagged Anthony Creek Trail, Both Mountain Trail, Ridge Runner, Russell Field Shelter, Russell Field Trail on May 4, 2016 by blogginggazelle.